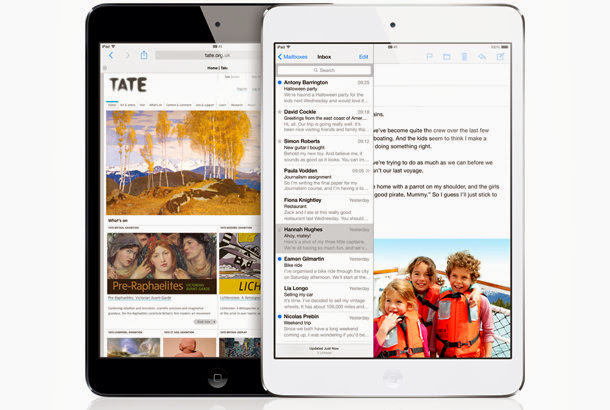 We’ve been looking at the tablet market and all anyone’s commented so far is ‘what about the iPad?’ Well, here it is. Apple more or less defines the tablet market – despite Bill Gates’ ahead-of-its’ time tablet in the ’90’s. Yes, Microsoft was there first, and we’ll look at the fight back, the Surface, next time. For now, $100 more than a Nexus 7, gets an iPad Mini. Not the ‘maxi’ iPad with Retina Display that’s $500 for the base model. No, in this list, the Mini is much better value, although the $170 saving means you lose the iPad with larger Retina Display and A6X processor. The Mini uses an A5 processor in a much lighter and thinner device – 0.68 lbs (309g), which is slightly heavier than a Nexus 7, but has an inch more screen space. Why go with the Mini? If you love Apple, iPhone, and iOS, perhaps the simplest operating system to use, and if you’re tied into the Apple ecosystem (yeuk!) with your iPhone or an older iPad, Apple’s App Store is stuffed with tablet-optimised apps where Android still lags behind, making the Mini a no-brain decision. Battery life for the Mini is best in class; it will easily make it through the day. And as an Apple device, accessories are plentiful – keyboards, cases, stands et al. That’s partly because they have so many choices, and it’s hard to know what to trust.